The adoption of the landmark Voting Rights Act in 1965 enfranchised millions of Americans and is widely regarded as the crowning achievement of the civil rights movement. And yet fifty years later we are still fighting heated battles over race, representation, and political power-over the right to vote, the central pillar of our democracy. A groundbreaking narrative history of voting rights since 1965, Give Us the Ballot tells the story of what happened after the act was passed. 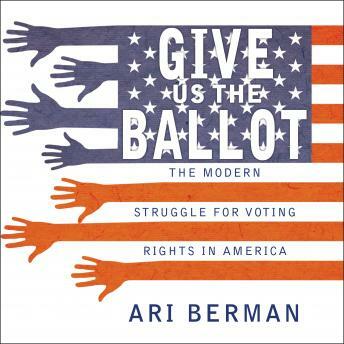 Through meticulous archival research, fresh interviews with the leading participants in the ongoing struggle, and incisive on-the-ground reporting, Ari Berman chronicles the transformative impact the act had on American democracy and investigates how the fight over the right to vote has continued in the decades since. From new strategies to keep minorities out of the voting booth, to cynical efforts to limit political representation by gerrymandering electoral districts, to the Supreme Court's recent stunning decision that declared a key part of the Voting Rights Act itself unconstitutional, Berman tells the dramatic story of the pitched contest over the very heart of our democracy. At this important historical moment, Give Us the Ballot brings new insight to one of the most vital political and civil rights issues of our time.